Finally I have come upon an easy task! It turns out that sanding, at least with a powered sander, is eeeaaasssyyy. Yay! It’s gratifiying to see changes so quickly, with so little effort. Caulking the screw holes and edges with silicone is easy too. It’s been a nice few days. The roof is now ready for some love with the liquid EPDM. 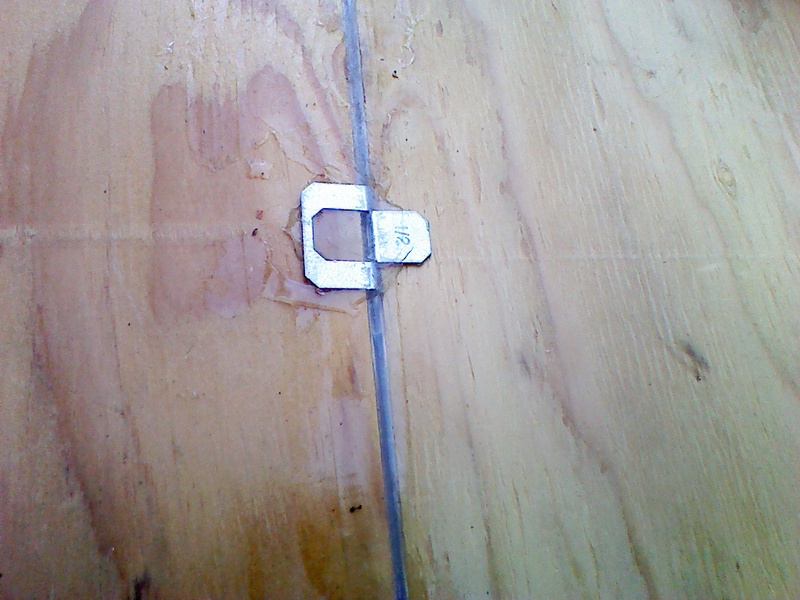 I remembered why I bought it ~ It’s for smoothing over anything that could possibly tear the sheet of rubber roofing. The silicone was fantastic for that too, but I want to make absolutely sure that this roof WORKS. I have a slight fear of the silicone not staying adhered, although that’s probably silly. Another fun part of this stage in the roof is that I can switch back and forth between different tasks. The fascia is now painted ~ a pretty, soft powdery yellow that was left over from painting my mother’s house. I picked it out for her originally, and just love it…no matter how gloomy it is, the yellow glows with a cheerful light. I don’t want seams to show in the fascia, so cut them at an angle where they will join. According to a contractor I met, angles are hard for the eye to detect…I vaguely remember learning something like that back when I worked at State Farm. So much information is roaming in the depths of my poor, jumbled brain…. He also suggested I sister a painted bit of wood behind the joined edges to make them strong. That was easy ~ I just used the angled cut-off bits. They are already painted, and are exactly the right size. They are sitting now, glued and clamped together, waiting to be hung. Phew! While waiting for the various caulks, paints, and glues to dry, I managed to hang more sheathing. Handling plywood has been the most difficult part of this whole process. There isn’t anything fun about it at all ~ the stuff is heavy, awkward, and splintery. I hate it. At least there’s immediate gratification to see the house getting enclosed. If I had someone working with me, it would be tremendously easier. Working alone has drawbacks. Working alone. Yes, there are drawbacks. Tasks take much longer alone than with help. That’s the biggie. It can be dangerous, as no one is around if I get hurt. That should be the biggie for me, but I’m used to being alone so don’t think about it too much. There isn’t anyone to bounce ideas off of when I get stuck. Something that I am a little embarrassed to admit is that it’s a bummer to not have anyone to high-five over achievements….nobody to admire Oliver’s Nest but me. Recording my progress here is helping with that. Being able to go back and re-read how ON was put together by me…well, this way it won’t get lost with so many other memories. There are benefits to working alone, too. I go at my own pace, without guilt at holding anyone back. I make all the decisions, so my little home will be a reflection of my ideas come to fruition. There’s a deep feeling of accomplishment. Lastly, given my “issues”, it feels safe to not worry about having to rely on others to move forward. Granted, I’ve had a couple hours of people helping heft plywood, but since then I’ve come up with ideas to do it myself. Much less tension and worry. But enough of that! Getting stuff done! Woowee! Cheers for me and everyone else who is building their own shelter with fun and love! Go, Tiny Housers! 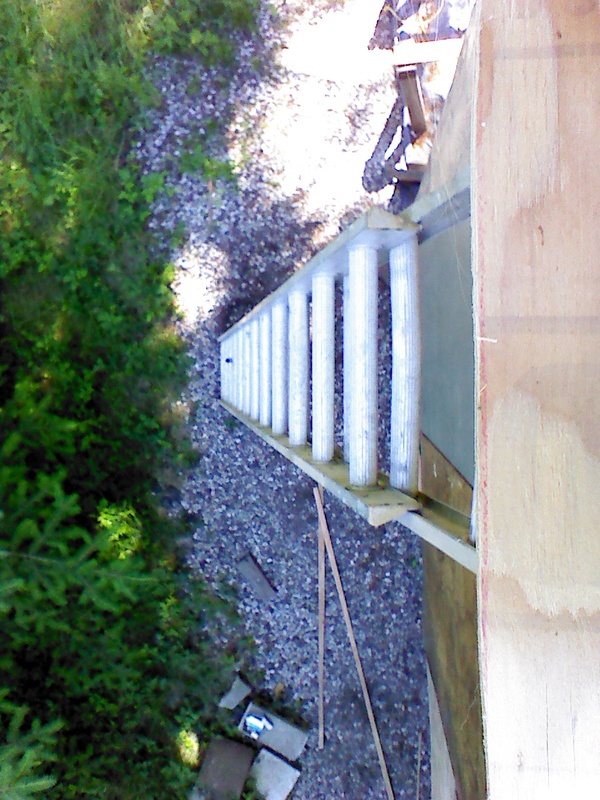 Ladder to the roof from above…SUPER fun to haul things up this! 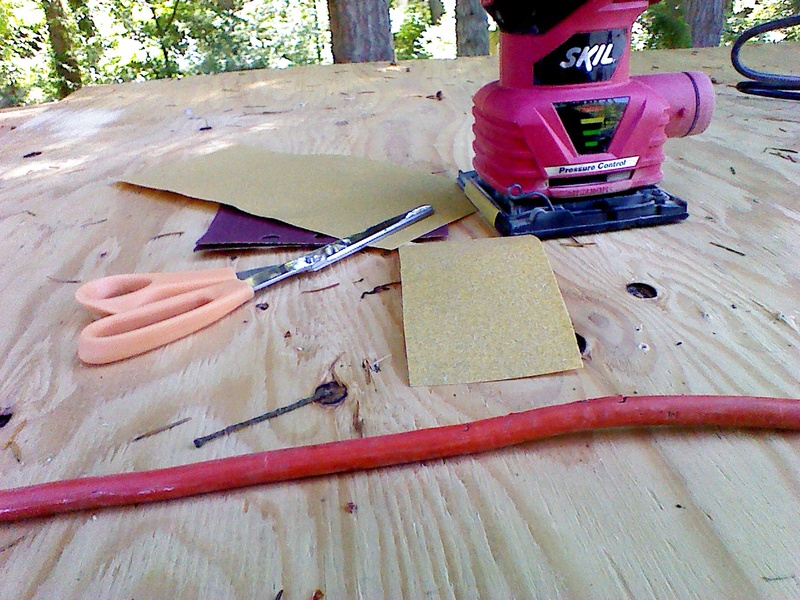 I can use any sandpaper with this little sander, which makes it flexible to use. It has a smaller hand-hold, so it’s comfortable. All cracks, screw holes, and all other spaces filled with silicone. I smoothed silicone over the clips, too. Fascia being painted a pretty pale yellow. I like the roof dimensions, although it is over-width. Using a cut off bit for the sister. I’ll glue them together once they are hung. ← Yay, Summer! And An EPDM Roof Update.